Inky Fairy Designs: TGF 3rd Annual Customer Blog Hop! TGF 3rd Annual Customer Blog Hop! I am SO excited - I think I have participated in this hop since it began and it's really exciting for me this year as I'm wrapping up my dream term as a farmer. I thought for this hop I would share my family Christmas cards with you. I almost always create photo cards and this year I thought I was going to stamp our cards and just tuck in a wallet of the kiddos but hubby said to me the other day, I really like your photo cards and that was all I need to hear to make them again! 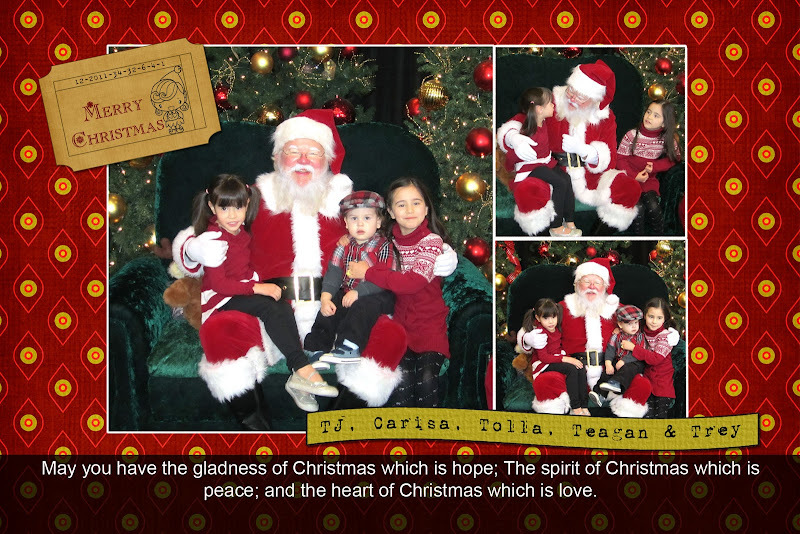 We took our kids to see Santa the other day and the pictures turned out amazing so it was a no brainer to use a couple of them for our cards this year. The expressions and moments captured with each click are perfect. It is a super long hop so I don't want to get into one of my long winded blog posts today! LOL Here is our card which I will finally be sending out TODAY!!! I know, late but ah well. Such is the story of me. What do you think? I really love how it turned out this year. I kept it simple with the pictures being the highlight. I always like to add a Christmas quote or saying and this one really stuck out to me this year. Do you see Elf Anya on the ticket!!! Isn't she adorable? One of my favorite things about digital stamps is that I can add my favorites to my Christmas cards each year and Elf Anya is definitely one of my favs. I kept begging to bring her back since she was released just before I became a TGF fan & was thrilled to see her as a ltd digital stamp! The digital papers and ticket are all from Sassy-Designs. Anyway, I hope you enjoy the hop and thank you so much for being such loyal followers during my term as a farmer. Many of you know how much this has meant to me and it's been such a blast, ending way to soon!!! But I am really excited to see the next batch come and do their thing. Now enjoy the rest of the hop and if you want to start at the beginning for the FULL list of everyone participating, check out the TGF Blog. There are THREE grand prizes being given away, one in each category of Holiday & General as well as for a non-particpant who hops with us and leaves comments all the way through!!! Wowsa! I had to do a closer look! What fun hiding Elf Anya on the ticket! Prescious memories, Carisa! Carisa!! Your creativity BLOWS. MY. MIND!! You're on fire with this girl!! Amazing. Very creative way to use those digis. Great idea for so many digi projects. Absolutely sweet, Carisa! You did a great job! Wonderful and tender layout. Love the vintage feel of Elf Anya. Great Idea. this is sooo adorable! love the pictures with santa and boy, he really looks like santa with the rosy cheeks and all! i love the ticket idea! so cute! happy holidays! Absolutely wonderful card. The layout is great, and the Santa looks like the real deal! Great layout. The pics of your kids are great and so is elf anya. So adorable! Love the elf Anya ticket! So creative! Definitely a creative use for TGF images! Love the layout, and the pictures. Carisa, the ticket is clever and i love how you made this a beautiful Christmas card! Beautiful.. Great way in incorp Elf Anya.. Great Job. Beautiful Christmas LO. Really like it. Fabulous project Carisa, and lovely family Santa photo. Your children are divine. Carisa this is such a sweet and darling keepsake!! LOVE it! LOVE IT! How sweet to use Anya Elf on your Christmas cards...clever! Oh that is so precious!! Great page! hahaha, i had to search, but found her! super cute tag! love how you added her to your Christmas card Carisa. Fun idea! Super cute photo card and SUPER cute family you have there! Soooo cute! Hope your family has a wonderful Xmas and New Year! *finally* My No Lines Coloring Tutorial!!! Oh snap Lizzie! Birthday Blog Party! Vintage Cards with Helmar & FabScraps!